Stop working because you "have to" and start living the way you WANT to. of time it will take you to get there. This surprisingly simple, extremely powerful new formula makes it not just possible — but guaranteed. Maybe you're really good at what you do. Maybe your job makes a difference in people's health or safety or wellbeing. Maybe you love your colleagues and have a great office social life. Now, notice I'm not saying "if you didn't work." I'm saying, "if you didn't have to work." My kids' college fund wouldn't be in jeopardy. My wife and I would still be looking forward to the same comfortable retirement we're on track towards now. Our family could continue on with exactly the same lifestyle we have, in the same great house, enjoying all the same things we enjoy today. Pursue your real interests and passions – instead of sidelining them because you "can't make a decent living doing that"
Not only do I know you can do this. I know HOW. 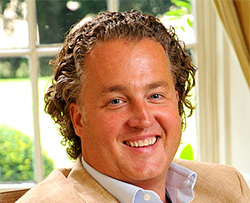 Stefan Wissenbach is a successful entrepreneur, author and speaker. Coming from a humble but happy childhood, he has built and sold several successful businesses and is an adviser to a number of the world's leading business figures and entrepreneurs. He is passionate about providing education and inspiration to enable others to fulfill their potential and bridge the gap between aspiration and achievement. His unique approach is to simplify the complex and provide a framework for people to take action so they can make immediate and ongoing improvements in their lives and achieve greater levels of success and happiness. He does this by distilling his lifetime of learning and study into simple success strategies that anyone can master. He is married, has three children and lives England. Of course, as anyone who scratches the surface of magic soon realizes, there no "magic" to it at all. It's all knowledge, skill, and technique. Magic isn't about mystery. It's about mastery. Some kids are probably shattered when they discover this. I was thrilled. It made me realize, for the first time, that wealth, comfort, and freedom — which to me at that time seemed like the most magical things of all — might actually be within my grasp. So, from a very early age, I set out to create that wealthy, comfortable, burden-free life for myself and the people I loved. Then I landed on this discovery. Suddenly, I had absolute clarity about what I wanted out of life. Not just the "wealth", "success", and "happiness" I'd longed for as a kid, but a precise, detailed definition of what those things meant for me, personally. People nearing retirement have used it to transition into a profitable and rewarding "second act" doing something they really love — and quickly add tens and even hundreds of thousands MORE dollars to their next egg. In six audio sessions, I'll lay out the complete Magic Formula process, and personally guide you through each and every step of it. I'll give you the hows and whys behind every secret and strategy, and share real-life stories that illustrate how each one plays out in the actual everyday world. That's the real key. This formula is designed to saturate every aspect of your life. The things you already do well, you'll do even BETTER. The things you should be doing but aren't, you'll START doing. And all the pieces will be working together in perfect harmony to move you at high speed towards that work-optional date. 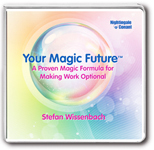 Order Your Magic Future™ today for just $99.95 — that's $40 off the regular program price. If you're unsatisfied for any reason, simply return it within 30 days for a full refund. No questions asked.